FIG. 12 shows a block diagram of this conventional mobile terminal. A cellular signal received from a base station via an antenna  100 is sent to a signal receiver 101, then subjected to such processings as a receiving processing with a radio/intermediate frequency, base band signal demodulation, A/D conversion, etc. to generate a digital signal. The received signal generated by the signal receiver 101 is stored in a received signal memory 102. The received signal stored in the received signal memory 102 is then inputted to a delay profile generator 103. The delay profile generator 103 generates a delay profile from a received signal stored in the received signal memory 102 with use of, for example, a matched filter. The delay profile generated by the delay profile generator 103 is then written in a delay profile memory 104 and retained there. The delay profile written in the delay profile memory 104 is inputted to both of a position calculator 105 and an interference cancel determination unit 106. The interference cancel determination unit  106 uses the delay profile stored in the delay profile memory 104 to determine whether to cancel a signal received at a time as an interference one. A received signal replica generator 107 determines an amplitude value of a replica of a received signal with use of the delay profile with respect to the timing at which interference cancellation is required. An adder 108 subtracts the replica of the received signal calculated by the received signal replica generator 107 from the received signal read from the received signal memory 102 to generate an interference-canceled received signal, then writes the signal in the received signal memory 102. The position calculator  105 calculates the current position of the mobile terminal with use of the interference-canceled delay profiles retained in the delay profile memory 104. In the case of the conventional mobile terminal described above, many calculations are required to generate a delay profile in the delay profile generator  103. For example, in the case of a TIA/EIA/IS-95 system, which is a cellular system that employs the CDMA method, the system needs about 108 calculation circuits. In addition, when consideration is taken to the time to access the received signal memory 102, it takes several tens of seconds to generate a delay profile in the delay profile generator 103. When it takes such a long time to generate a delay profile, the response of position measurement slows down, resulting in the degradation of the serviceability of position information. The conventional mobile terminal requires a large capacity received signal memory. For example, if the TIA/EIA/IS-95 system has a received signal memory for storing both inphase and quadrature components of received signals for one frame and corresponding to a bit width effective for interference cancellation, the memory needs a capacity of about 10 6 bits. The received signal memory needs a larger capacity to improve the position measurement accuracy and the quality of received signals. Providing the mobile terminal with such a large capacity memory will cause the mobile terminal to be expanded in size, thereby the portability will be lowered and the manufacturing cost will increase. FIG. 12 is a block diagram of a conventional mobile terminal. In FIG. 1, cellular radio base stations  801 to 803 are provided around a mobile terminal 800, which is typically a portable telephone. The radio base stations 801 to 803 are used for communicating with the mobile terminal 800. A unique PN offset value is assigned to each of those base stations 801 to 803. In this embodiment of the invention, the mobile terminal  800 receives signals from at least three base stations to measure a difference of the transmission distance among the signals received from those three base stations. The positions of those three base stations are used as known values for measuring the current position of the mobile terminal 800. Signals received from base stations via the antenna  100 are sent to a signal receiver 101. The signal receiver 101 is composed of a radio part (receiver and transmitter), a base band processing part, etc. The radio part performs such receiving processings as amplification, frequency conversion, etc. of high and intermediate signals for cellular signals received from the base stations via the antenna 100 and the base band processing part performs such processings as demodulation, AD (Analog to Digital) conversion, etc. of base band signals to generate received signals. Received signals generated by the signal receiver 101 are written in the received signal memories 1021 to 102N sequentially via the received signal memory controller 300. The received signals written in the received signal memories 1021 to 102N are read by the delay profile generators 1031 to 103N via the profile generation memory controller 301, then inputted to the delay profile generators 1031 to 103N (see FIGS. 3 and, 4). In other words, each of the received signal memories 1021 to 102N is divided into a plurality of areas (or composed of a plurality of memories) and the plurality of different areas (or different memories) are configured so as to be accessed concurrently for reading/writing. The received signal memory controller 300 and the profile generation memory controller 301 manage writing/reading in/from those received signal memories 1021 to 102N, as well as accesses to the received signal memories 1021 to 102N. Concretely, the received signal memory controller 300 controls data write accesses of the signal receiver 101 to the received signal memories 1021 to 102N. The profile generation memory controller 301 controls data read accesses of the delay profile generators 1031 to 103N to the received signal memories 1021 to 102N. Each of the delay profile generators  1031 to 103N includes, for example, a matched filter and is enabled to calculate a correlation value between a received signal and a spreading code sequence at each receiving timing to generate a delay profile that denotes a value corresponding to the correlation value. A delay profile generated by a delay profile generator ( 1031 to 103N) is written in a delay profile memory (1014 to 104N) and retained there. Each delay profile memory (1041 to 104N) is prepared so as to have its corresponding delay profile generator (1031 to 103N) . Delay profiles retained in a delay profile memory (1041 to 104N) are read by the position calculator 105 and the interference determination unit 106 via the delay profile memory controller 302 respectively, then inputted to the position calculator 105 and the interference determination unit 106. The interference cancel determination unit  106 uses a delay profile stored in the target delay profile memory (1041 to 104N) to extract both inphase and quadrature components of the delay profile to obtain a delay profile power value. The power value is then compared with a predetermined threshold value to determine whether to cancel a signal received at a time as an interference one (see FIG. 6). The received signal replica generator  107 determines an amplitude of the received signal replica according to the values of the inphase component 200 and the quadrature component 201 of the delay profile at the timing at which the interference cancel determination unit 106 has determined to cancel the signal from the received signals as an interference one. The received signal replica generator 107 then generates a replica of the received signal according to the determined amplitude of the received signal replica. In other words, the received signal replica generator 107 calculates the intensity of each received signal stored in the received signal memory 102 and to be canceled as an interference one. The adder  108 reads a received signal stored in the received signal memory (1021 to 102N) to subtract the received signal replica generated by the received signal replica generator 107 from this received signal to generate an interference-canceled received signal, then stores the received signal in the received signal memory (1021 to 102N) again. The CPU of the position calculator  105 is composed of such elements as a memory required for calculation and performs processings required for position calculation with use of the delay profiles retained in the delay profile memories 1041 to 104N under the control of the software stored in the memory. In other words, the position calculator 105 calculates to obtain the current position of the mobile terminal, which is a receiving point, with use of the delay profiles obtained by canceling interference signals in the above procedure. The position calculator 105 uses, for example, the trilateration principle disclosed in JP-A No. 181242/1995 for the position calculation. Concretely, the mobile terminal can be composed of a received signal memory controller  300, received signal memories 1021 to 102N, a memory controller for profile generator 301, delay profile generators 1031 to 103N, a delay profile memory controller 302, and a received signal replica generator 107 that are all integrated into one semiconductor device (LSI) connected to a CPU used for position calculation. An interference cancel determination unit 106 may be added to the above configuration of the LSI. In addition, the position calculator 105 may also be added in the LSI. FIG. 3 shows a configuration of the received signal memory composed of received signal memories  1 (1021) to N (102N). If the number of words (the number of addresses) in the received signal memory  102 required for the above described conventional mobile terminal (FIG. 12) is assumed as W [words], the number of words in each of the received signal memories 1 to N becomes W/N [words], since the received signal memory 102 is divided into N areas in the mobile terminal in the first embodiment. The received signal memory controller  300 begins writing of received signals generated by the signal receiver 101 in the start address of the received signal memory 1. The received signal memory controller 300, when ending the writing in the last address of the received signal memory 1, continues the writing of received signals in the start address of the received signal memory 2. After writing of received signals in the last address of the received signal memory 2, the received signal memory controller 300 further continues the writing in the start address of the received signal memory 3. The received signal memory controller 300 repeats the writing of the received signals generated by the signal receiver 101 in those received signal memories sequentially from 1 to N. Under the control of the received signal memory controller 300, the signal receiver 101 comes to handle received signal memories 1 to N, each having a W/N [word] address space as one memory having a W [word] address space. Similarly, the received signal memory controller  300 also controls the accesses of the received signal replica generator 107 to the received signal memories 1 to N via the adder 108. The received signal replica generator 107 thus decodes addresses under the control of the received signal memory controller 300 so as to handle the received signal memories 1 to N as one memory having a W [word] address space. The memory controller for profile generator  301 controls received signal read accesses of the delay profile generators 1 (1031) to N (103N) to the received signal memories 1 to N. The memory controller for profile generator 301 controls those accesses of the delay profile generator 1 so as to be done sequentially in an ascending order of memory numbers 1, 2, 3, . . . N. Similarly, the memory controller for profile generator 301 controls the accesses of the delay profile generator 2 so as to be done sequentially in a cyclical order of memory numbers 2, 3, 4, . . . N, 1. Similarly, the memory controller for profile generator 301 controls the accesses of the delay profile generator N to the received signal memories so as to be done sequentially in an order of memory numbers N, 1, 2, 3, . . . N-1. By controlling the accesses of each delay profile generator to each received signal memory such way, it is avoided that the same area of the received signal memory is accessed by a plurality of delay profile generators. Consequently, each received signal memory is accessed for reading only from one delay profile generator. As a result, there is no need to speed up the accesses to the received signal memories  1 to N, thereby the received signal memory can be composed of low-price memories. FIG. 5 shows a configuration of a delay profile memory  104 composed of memories 1 (1041) to N (104N). If the number of words (the number of addresses) of the delay profile memory  104 required for the above described conventional mobile terminal (FIG. 12) is assumed as V[words], the number of words in each of the delay profile memories 1 to N comes to become V/N [words], since the mobile terminal in the first embodiment (FIG. 2) is divided into N areas. Delay profiles generated by the delay profile generators  1 (1031) to N (103N) are written in their corresponding delay profile memories 1 (1041) to N (104N) respectively. In other words, one delay profile data generated by each of the profile generators 1031 to 103N is written in each of the delay profile memories 1041 to 104N. The delay profile memory controller  302 functions just like the received signal memory controller 300 to decode addresses so that the position calculator 105 and the interference cancel determination unit 106 can handle delay profile memories 1 to N, each having a V/N [word] address space, as one memory having a V[word] address space. FIGS. 6A, 6B,  6C show how interference cancellation is determined. The interference cancel determination unit  106 extracts both inphase component 200 and quadrature component 201 from each delay profile retained in the delay profile memories 1041 to 104N to calculate (inphase component)2+(quadrature component)2 to obtain a delay profile power value 202 at each timing. FIG. 6A shows this inphase component 200 and FIG. 6B shows the quadrature component 201. FIG. 6C shows the delay profile power value 202. The interference cancel determination unit 106 compares the delay profile power value 202 with the predetermined threshold value 203 to determine a timing at which the delay profile power value exceeds the threshold value, then determines performing of interference cancellation at the timing and not performing of the interference cancellation at any timing at which the delay profile power value is less than the threshold value. This threshold value 203 is determined, for example, by multiplying the maximum value of the delay profile power value by a predetermined coefficient. As described above, because the mobile terminal in the first embodiment is provided with a plurality of delay profile generators  1031 to 103N, a plurality of delay profiles can be processed in parallel. Consequently, the position calculation time can be reduced, thereby the serviceability of position information can be improved. Signals received from base stations via the antenna  100 are sent to the signal receiver 101. The signal receiver 101 is composed of a radio part (receiver and transmitter), a base band processing part, etc. The radio part performs such receiving processings as amplification, frequency conversion, etc. of high and intermediate signals for cellular signals received from the base stations via the antenna 100 and the base band processing part performs such processings as demodulation, AD (Analog to Digital) conversion, etc. of base band signals to generate received signals. Received signals generated by the signal receiver 101 are inputted to the received signal generator 103 directly without being stored in the received signal memory. Delay profile generator  103 includes, for example, a matched filter and is enabled to calculate a correlation value between a received signal and a spreading code sequence at each receiving timing to generate a delay profile that denotes a value corresponding to the correlation value. A delay profile generated by a delay profile generator  103 is written in the delay profile memory 104 and retained there. The delay profile retained in the delay profile memory 104 is read by the position calculator 105 and the interference determination unit 106, then inputted to the position calculator 105 and the interference determination unit 106 respectively. The interference cancel determination unit  106 uses a delay profile stored in the target delay profile memory 104 to obtain a delay profile power value. The power value is then compared with a predetermined threshold value to determine whether to perform interference cancellation. The same method as that used in the mobile terminal in the first embodiment (FIG. 6) can be used for this comparison. The delay profile replica generator  120 estimates whether or not a signal output at a timing at which the interference cancel determination unit 106 has determined performing of interference cancellation might interfere the result of the calculation of the correlation value at another timing, then outputs the result. In other words, the delay profile replica generator 120 generates a replica of a target delay profile to be canceled as an interference one. The correlation value memory  121 stores K correlation values of a spreading code sequence whose cycle is a spreading factor K.
The adder  122 reads a delay profile from the delay profile memory 104 and subtracts the replica of the delay profile calculated by the delay profile replica generator 120 from this delay profile to generate an interference-canceled delay profile, then writes the profile in the delay profile memory 104 again. The CPU of the position calculator  105 is composed of such elements as a memory required for calculation and performs processings required for position calculation with use of delay profiles retained in the delay profile memory 104 under the control of the software stored in the memory. In other words, the position calculator 105 calculates the current position of the mobile terminal, which is a signal receiving point, with use of interference-canceled delay profiles in the procedure to be described later. Next, a description will be made for the operation of the mobile terminal  800 that is positioned closely to the base station A and enabled to calculate its current position with use of a signal from the base station A, as well as signals received from the far-away base stations B and C as an example of the procedure for interference cancellation in the mobile terminal shown in FIG. 7. The signal receiver  101 generates a received signal S(t). The S(t) is represented by a complex prime number. The real part represents the inphase component of the received signal and the imaginary part represents the quadrature component of the received signal. The S(t) is represented by the expression 1 as shown below. To simplify the description, only the pilot channel component is described and description for other channel components and noise components are omitted here. In the above expression 1, the complex prime number S x(t) denotes a signal output from the base station X(X=A, B, or C). The S x(t) is also represented by the expression 2 as follows. Here, the complex P(t+T x) denotes a spreading code sequence having a phase Tx at the standard timing (t=0) . The real number Rx denotes an amplitude of the received signal and the complex prime number ejθx denotes the phase component of the received signal. When consideration is taken for the expression 1, each of M(T A) and M(TB) is a prime number and both of M(TA) and M(TB) are represented by the expressions 3 and 4 as follows. The M(TA) and M(TB) are results of correlation value calculations at the timing TA corresponding to the base station A and at the timing of TB corresponding to the base station B. The interference cancel determination unit  106 calculates (inphase component)2+(quadrature component)2 with use of both inphase and quadrature components of a delay profile stored in the delay profile memory 104 to obtain a delay profile power value. The interference cancel determination unit 106 then compares the delay profile power value with a predetermined threshold value at each timing to determine performing of interference cancellation at a timing at which the delay profile power value is higher than the threshold value and not performing at a timing at which the delay profile power value is lower than the threshold value (see FIG. 6). Next, a description will be made for the operation of the delay profile replica generator  120 in this embodiment to estimate interference of a signal (a signal at the timing TA) output from the base station A to be exerted on a signal (a signal at the timing TB) output from the base station B. In the expression 6 that denotes a result of the correlation value calculation at the timing T B, the second part on the right side denotes a signal output from the base station B, that is, a correlation value corresponding to a desired wave and the first part on the right side denotes a signal output from the base station A, that is, a correlation value corresponding to an interference wave. The delay profile replica generator 120 estimates the first term on the right side in the above expression 6 with use of the result M(TA) of the correlation value calculation at the timing TA shown in the expression 5. Because the mobile terminal  800 exists closely to the base station A (see FIG. 1) in this case, the amplitude value RA of the received signal is far larger than that RB of the received signal and the amplitude RA of the received signal becomes far larger than that Rc of the received signal. The relationship among RA, RB, and Rc in the expression 7 is thus satisfied as shown below. In addition to the expression 7, the approximation of the M(TA) in the expression 5 is also as shown in the expression 8 when a correlation value of a spreading code sequence takes a small value at the time of phase unmatching. Here, L=T B−TA is satisfied. Because the spreading factor K and the cycle of the spreading factor sequence are set equally, the L value becomes any of 0, 1, . . . K−1. Consequently, the correlation value to be obtained from the expression 10 can be calculated beforehand with respect to every L value. FIG. 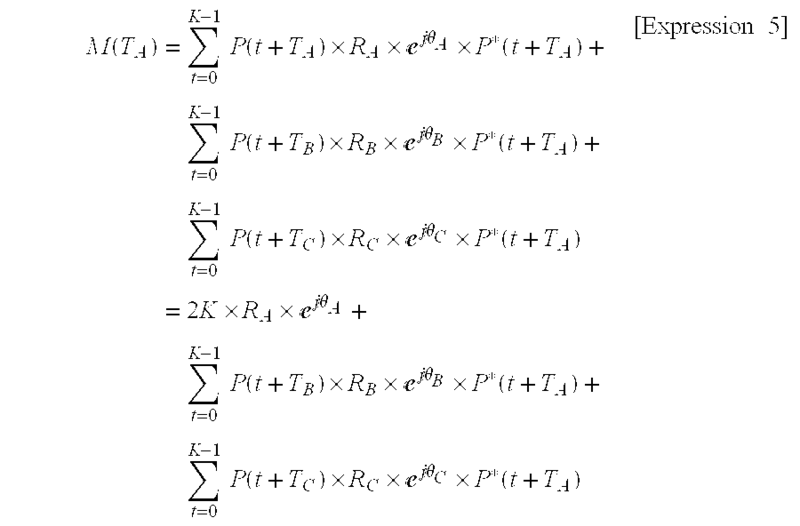 8 shows a method for storing correlation values in the correlation value memory  121. According to this storing method shown in FIG. 8, the correlation values (shown on the right side in the expression 10) are stored in the ascending order of L values assumed as addresses between L=0 and L=K−1. FIG. 9 shows another method for storing correlation values in the correlation value memory  121. The method shown in FIG. 9 can reduce the capacity of the correlation value memory 121 required to store the correlation values to a half of that employed by the method shown in FIG. 8. The correlation value, when L is assumed to be any of ceiling (K/2)+1, ceiling (K/2)+2, . 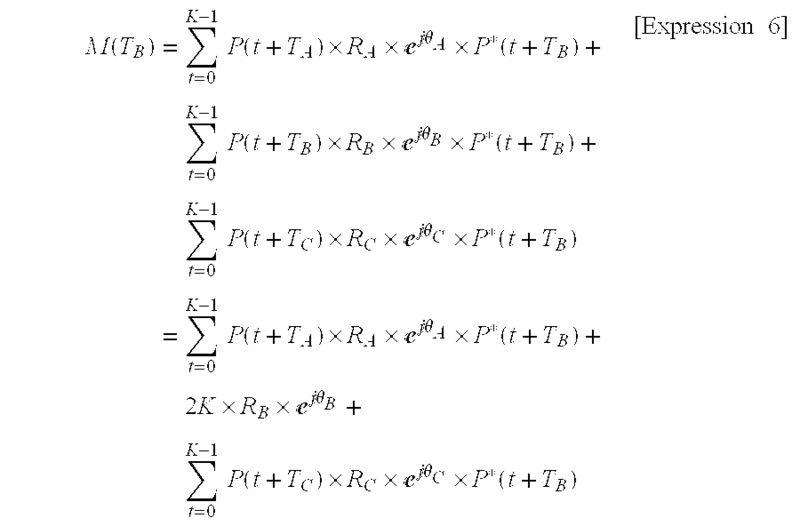 . . , K−1 in the expression 10, can be obtained from each of the correlation values of ceiling (K/2)−1, ceiling (K/2)−2, . . . 1 when the K value is even. When the K value is odd, the correlation value can be obtained from any of ceiling (K/2)−2, ceiling (K/2)−3, . . . 1. When this method is used, correlation values are stored in the correlation value memory  121 as shown in FIG. 9. This is why this method can reduce the capacity of the correlation value memory 121 required for storing correlation values to the half of that of the method shown in FIG. 8. As shown in the expressions 9 and 10, the delay profile replica generator  120 can use a result of the correlation calculation M(TA) stored in the delay profile memory 104, a correlation value corresponding to the timing difference (phase difference) TB−TA, and a preset spreading factor K to calculate the interference (the first term on the right side in the expression 6) of the signal output from the base station A to be exerted on the signal output from the base station B. The above processings are performed at each timing of each delay profile of the base station B and similar processings are also performed for each delay program of the base station C. Consequently, it is possible to store delay profiles of both base stations B and C in the delay profile memory  104. At this time, the interference of a signal output from the base station A is already canceled from among the profiles of those base stations B and C.
The adder  122 reads the M(TB) represented by the expression 6 from the delay profile memory 104, then subtracts the first term on the right side in the expression 6 calculated by the delay profile replica generator 120 from the M(TB) to generate the M′ (TB), then writes the M′ (TB) in the delay profile memory 104. Such way, the mobile terminal in the second embodiment, provided with the correlation value memory  121 and the delay profile replica generator 120, can generate a replica of each delay profile with use of the correlation value stored in the correlation value memory 121 and subtract the replica from the delay profile of another base station to make interference cancellation. The mobile terminal can thus be configured without using any received signal memory, thereby the hardware scale, especially the memory capacity of the mobile terminal provided with positioning functions can be reduced and the mobile terminal can be reduced in both size and price. Signals received from base stations via the antenna  100 are sent to the signal receiver 101. The signal receiver 101 is composed of a radio part (receiver and transmitter), a base band processing part, etc. The radio part performs such receiving processings as amplification, frequency conversion, etc. of high and intermediate signals for cellular signals received from base stations via the antenna 100 and the base band processing part performs such processings as demodulation, AD (Analog to Digital) conversion, etc. of base band signals to generate received signals. Received signals generated by the signal receiver 101 are inputted to corresponding received signal generators 1031 to 103N directly without being stored in the received signal memory. Delay profiles generated by the delay profile generators  1031 to 103N are written in the delay profile memories 1041 to 104N and retained there. Each of these profile memories 1041 to 104N is corresponded to one of the delay profile generators 1031 to 103N. The delay profiles retained in the delay profile memories 1041 to 104N are read by the position calculator 105 and the interference determination unit 106 via the delay profile memory controller 402, then inputted to the position calculator 105 and the interference determination unit 106 respectively. In other words, the delay profile controller 402 functions just like the delay profile memory controller 302 to decode addresses, so that the position calculator 105, the interference cancel determination unit 106, and the adder 122 in the mobile terminal (FIG. 2) in the first embodiment can handle the delay profile memories 1 to N, each having a V/N[word] address space, as one memory having a V[word] address space. The interference cancel determination unit  106 uses a delay profile stored in a target delay profile memory (1041 to 104N) to obtain a delay profile power value. Then, the power value is compared with a predetermined threshold value to determine whether to cancel a signal received at a time as an interference one. The same method as that in the mobile terminal in the first embodiment (FIG. 6) can be used for this comparison. The delay profile replica generator  120, after estimating whether or not a signal output at a timing at which the interference cancel determination unit 106 has determined cancellation of the interference interferes the result of the calculation of the correlation value at another timing, outputs the result. In other words, the delay profile replica generator 120 generates a replica of a target delay profile to be canceled as an interference one. The adder  122 reads a delay profile from a delay profile memory (1041 to 104N) and subtracts the replica of the delay profile calculated by the delay profile replica generator 120 from this delay profile to generate an interference-canceled delay profile, then writes the profile in a delay profile memory (1041 to 104N) again. The CPU of the position calculator  105 is composed of such elements as a memory required for calculation and performs processings required for position calculation with use of delay profiles retained in the delay profile memory (1041 to 104N) under the control of the software stored in the memory. In other words, the position calculator 105 calculates an interference-canceled delay profile in the same procedure as that of the mobile terminal in the second embodiment (FIG. 7), then uses this delay profile to calculate the current position of the mobile terminal, which is a signal receiving point. Such way, the mobile terminal in this third embodiment, since it is provided with a plurality of delay profile generators  1031 to 103N, can generate a plurality of delay profiles in parallel, thereby the position calculating time can be reduced. In addition, the mobile terminal, since it is provided with the correlation value memory 121 and the delay profile replica generator 120, can generate a replica of each delay profile with use of a correlation value stored in the correlation value memory 121 and subtract the replica from the delay profile of another base station so as to make interference cancellation that eliminates signal interference from other base stations. It is thus possible to omit the conventional received signal memory to configure the mobile terminal. As a result, the hardware scale, especially the memory capacity of the mobile terminal provided with positioning functions can be reduced to improve the serviceability of position information. In addition, the mobile terminal can be reduced in both size and price. position calculating means for calculating a position that is a signal receiving point with use of said delay profiles. calculating means for calculating said replica signal generated by said received signal replica generating means and each of said received signals to thereby cancel the interference component from among said received signals. wherein said delay profile retaining means is composed of a plurality of areas for retaining delay profiles generated by said plurality of delay profile generating means. wherein said plurality of delay profile generating means uses said information related to said received signals retained in said received signal retaining means to thereby generate delay profiles of said received signals. wherein said received signal replica generating means generates a replica of each signal determined so as to be cancelled as an interference one by said interference cancel determining means. wherein said interference cancel determining means calculates a delay profile power value of a delay profile at the timing of each of said delay profiles and determines an interference signal to be canceled as an interference one according to a result of a comparison between said calculated power value and a predetermined threshold value. position calculating means for calculating a position that is a signal receiving point with use of interference-canceled delay profiles retained in said delay profile retaining means. calculating means for calculating said replica of said delay profile generated by said delay profile replica generating means and each delay profile retained by said delay profile retaining means to thereby cancel the interference component from among said delay profiles. wherein said delay profile replica generating means uses said correlation value to generate a replica of each delay profile to be canceled as an interference one. wherein said correlation value retaining means outputs a complex conjugate of said autocorrelation value corresponding to a phase difference obtained by subtracting said phase difference from said sequence length when said delay profile replica generating means uses said autocorrelation value that is greater than the half of the length of said sequence used in calculation of said correlation value. wherein said delay profile replica generating means generates a replica of each delay profile determined so as to be canceled as an interference one by said interference cancel determining means. wherein said interference cancel determining means calculates a delay profile power value of each delay profile retained by said delay profile retaining means to determine a signal to be canceled as an interference one according to a result of comparison between said calculated delay profile power value and a predetermined threshold value. position calculating means for calculating a signal receiving point with use of said interference-canceled delay profiles. calculating means for calculating a replica of each delay profile generated by said delay profile replica generating means and a delay profile generated by said delay profile generating means to cancel the interference component from among said delay profiles. wherein said correlation value retaining means outputs a complex conjugate of an autocorrelation value corresponding to a phase difference obtained by subtracting said phase difference from the length of said sequence when said delay profile replica generating means uses an autocorrelation value of a phase difference that is greater than the half of the length of a sequence used in calculation of said correlation value. wherein said delay profile retaining means is composed of a plurality of areas, each retaining a delay profile generated by each of said plurality of delay profile generating means. wherein said interference cancel determining means calculates a delay profile power value of each delay profile retained in said delay profile retaining means to determine a signal to be canceled as an interference one according to a result of a comparison between said delay profile power value and a predetermined threshold value. position calculating means for calculating a position that is a signal receiving point with use of interference-canceled delay profile.